Welcome to the starting point for learning about derivatives. This page serves as a hub for all the pages on derivatives you'll find on this site. This is the place to start if you want to learn about this topic. The first question we'll try to answer is the most basic one: what is the derivative? I'll begin with an intuitive introduction to derivatives that will lead naturally to the mathematical definition using limits. Maybe you aren't aware of it, but you already have an intuitive notion of the concept of "derivative". You probably use it almost everyday. The word "derivative" doesn't serve as a very good description of it, I think. Basically, there are two ways of thinking about the derivative of a function. The first way is as an instantaneous rate of change. We use this concept all the time, for example, when talking about velocity. Velocity is the instantaneous rate of change of position. There is also a geometric interpretation of the concept of derivative. The derivative can be thought of as the slope of a curve. It is easy to define the slope of a straight line. That is usually learned in an algebra course. If you don't remember, or never have seen how that is done, don't worry, we'll review that. I think it is important to review it even if you have already seen it before, because it is very important for the understanding of derivatives. That is because the derivative of a function is a generalization of that concept to any curve, not necessarily a straight line. With calculus we realize that these two concepts are the same: the slope of a curve represents the instantaneous rate of change of a function. In the rest of this page I give an overview of everything you need to learn about derivatives and I give links to pages that go more in depth in each topic. As I said above, there are two ways of thinking about the derivative: one is a physical approach (rate of change) and the other is geometric (slope). It is essential to understand both perspectives, because one is more useful than the other in different situations. The essential idea behind the geometric approach is captured in the following picture. This picture shows how to calculate the slope of a straight line. In this picture we see the graph of a straight line, in green. This line is the graph of a linear function. 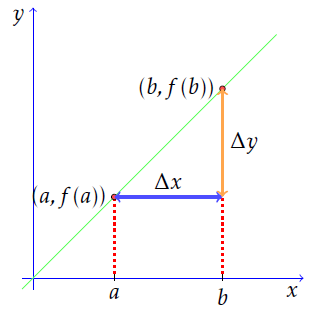 We take two points on the x axis, a and b, and the corresponding values of the function, f(a) and f(b). All of this may seem incomprehensible to you if you haven't seen the concept of slope before. It that is so, I recommend you to go straight to the page The Definition of Derivative: The Intuition Behind It. There we carefull review the concept of slope of a straight line and we go on to define the derivative using the intuitive notions. When we have a curve instead of a straight line, we take the same approach to try to calculate the slope. To actually calculate the slope at a single point we take a limit, and we arrive to the definition of the derivative. For the physical approach, we consider a more concrete problem: a train travelling at varying speed. We imagine that we measure the position of the train at different times, and then plot position vs. time. Recalling the definition of speed from physics, we realize that the calculation of speed is equivalent to the calculation of the slope of the curve given by the plot position vs. time. With this we realize that speed and slope are connected by a single concept: the derivative. In the following page we study in depth these two intuitive notions that lead to the same definition of derivative: The Definition of Derivative: The Intuition Behind It. After you understand both the geometric and physical intuition for the derivative of a function, the next step is learning how to calculate derivatives. After all, a definition is good only if you can use it. And your problem solving skills are what will be most heavily tested in any course or exam. We'll begin by directly applying the definition of the derivative of a function. To calculate the derivative of a function we need to solve a limit. All your limit-skills will come into play here. In the following page we'll learn the different tricks required to apply the limit definition of derivative to actually calculate the derivative of functions: Calculating the Drivative by Definition. After finding the derivative of some functions using the definition, we realize that it is a lot of work to do it that way. We then start to deduce some general rules that will serve us neat shortcuts to calculate derivatives more quickly. These are the differentiation rules. With these rules you can calculate the derivative of any function you know: trigonometric, exponential, logarithmic, etc. In the following pages we learn the intuition for each rule and solve some problems. It is better to go through the following pages in the order they are listed here. This is because we usually use a previously learned rule to deduce another. Armed with the differentiation rules, you will be able to find the derivative of "any function". You will find that, after you learn the basic rules, solving derivative problems is very similar to solving algebra problems. You just follow the rules of the game. The following pages cover some of the most important examples of derivatives. In these, you will learn some additional tricks that are good to know. Finally, on the page solving derivatives, we review all the tricks and techniques for solving problems where you need to calculate the derivative of something. After you learn to calculate derivatives, the next step is learning something even more fun and useful: how to apply derivatives to the solution of other problems. Derivatives have many applications in calculus itself and many other disciplines. Derivatives have applications in physics, computer science, chemistry, biology, economics and archeology, just to name a few.